A HIGH-ALTITUDE BLIZZARD, BUBBLING RIVERS OF LAVA, AND BEACHES WITH RAGING SURF; one thing’s for sure: The Hawaiian Islands offer no shortage of adventure! Teaming up with fellow explorer, Alana Aukai, thrill-seeking twins Gannon and Wyatt begin an expedition to study rarely visited parts of this Pacific paradise. When an ancient map is found on a drowning archeologist, the explorers shift their attention to uncovering the map’s secrets. To their astonishment, they discover that it might lead to one of Hawaii’s most puzzling mysteries—the burial place of the islands’ most-revered ruler, King Kamehameha the Great! Adding danger to an already perilous journey, someone else is after the map—someone who seems willing to do just about anything to get it. In the tradition of the historic journals kept by explorers such as Lewis and Clark, Dr. David Livingstone, and Captain James Cook comes the adventure series Travels with Gannon & Wyatt. From Africa to the South Pacific, these twin brothers have traveled the world. You never know what they will encounter as they venture into the wild, but one thing is certain—wherever Gannon and Wyatt go, adventure is their constant companion. 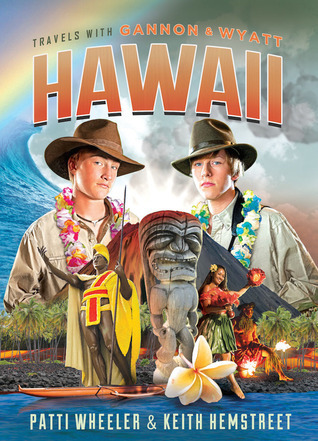 On a trip to Hawaii, twin explorers Gannon and Wyatt get a once-in-a-lifetime experience exploring the islands. After the boys attempt to rescue a drowning man in the ocean, they are handed a map -- which holds hidden secrets about ancient burial grounds... and with it, there's a new quest for Gannon and Wyatt! From snow-filled mountains, to the tropical beaches, Hawaii is turning out to be quite different than the twins expected. I think boys and girls will love this book and the whole series. It's fun to read, and parents will approve of the "education" one can glean from the pages of each book. Thanks to the author and Netgalley for the free review copy & for the opportunity to express my honest opinions. Travels with Gannon and Wyatt: Hawaii is available on Amazon in hardcover and e-book format.